Powers/Abilities: Astra is a mutant teleporter whose maximum range remains unrevealed. She has teleported across rooms and solar systems with equal ease. Apart from her "jaunts", as she refers to her teleports, Astra has access to a wide variety of advanced alien hardware, including airships and energy blast producing ionized gauntlets. She is also fluent in a multitude of alien languages, among them Kymellian and Rigellian. She mastered these during her often extended stays on other worlds. (X-Men II#86 (fb) - BTS) - Astra was revealed to be the first mutant to join Magneto's cause, believing that Homo superior should rule over Homo sapiens. (Uncanny X-Men I#367 (fb) - BTS / Magneto: Not a Hero#2 (fb) - BTS) - Astra felt romantically attracted to Magneto, which the manipulative master of magnetism used to further his own goals: by having her teleport across the galaxy to acquire new technologies for him. (X-Men Forever I#4 (fb) - BTS) - Using her interplanetary teleportation skills, Astra spent months helping Magneto stockpile a cache of otherworldly technology. Magneto ended up only using a fraction of the alien machinery at his disposal. Magneto ordered her to spy on possible Brotherhood recruits like Quicksilver and the Scarlet Witch in Transia and Nightcrawler while he was working at a traveling Bavarian circus. (X-Men Forever I#4 (fb) - BTS) - The Rigellian colonies were known for selling their technology at bargain prices, making them one of Astra's favorite destinations. After one of her trips, she returned with a magnetic polarity dissimilator. (X-Men Forever I#4) - After handing the machine to Magneto, the two engaged in one of their frequent arguments about how their new technology ought to be used. Astra was eager to make some money and expressed a growing disinterest in fighting for mutantkind's fate, which angered Magneto to no end. A time displaced Toad (Mortimer Toynbee) was witness to a particularly heated discussion. Astra took off, promising to do one final "jaunt" for Magneto before possibly leaving his side. She also slighted his newest recruit, the Toad, claiming she saw nothing but a useless little frog. (X-Men II#86 (fb) - BTS / X-Men I#1 - BTS) - Astra had apparently decided to remain at Magneto's side when Magneto started to form his Brotherhood of Evil Mutants. During their recruitment drive, Astra started dreaming of ruling the world, even without Magneto's help. They had succeeded in recruiting the Transian mutant twins Scartlet Witch and her brother Quicksilver, adding the mutant illusionist Mastermind soon afterwards. Deeming his Brotherhood complete, Magneto started planning their first mission but Astra decided to leave the team and struck out on her own. A betrayed Magneto branded her his sworn enemy. (X-Men II#86 (fb) / X-Men II#43 - BTS) - When the alternate reality mutant Holocaust destroyed Magneto's satellite headquarters Avalon, the comatose master of magnetism was put in an escape pod by his Acolyte Colossus (Piotr Rasputin). The pod landed in South America, where Astra happened to be the first to find it. Seeing her helpless former master, she came up with a devious scheme. She first undid the mental damage caused by Charles Xavier when he shut down Magneto's mind. Then she used a multitude of different alien technologies to create a functional bio-replicant (clone) of him, albeit with several modifications. The clone was made twenty years younger and lacked the original's subconscious self restraint, causing him to be more reckless with his powers. Astra also removed the body's inherent self-preservation reflexes so the clone wouldn't have any internal ceiling to his powers. This meant he could burn through his powers until death would follow. Six weeks after his clone came to life, Magneto woke up and was stunned and angered to see both Astra and his younger self. Leaping towards her, Astra deployed her clone of Magneto to battle him. Due to Astra's modifications, the clone proved too powerful for Magneto and he was forced to flee the scene. Overcome with joy at the sight of Magneto's defeat, she ordered the clone to chase Magneto and finish the job. Astra didn't stick around for the outcome, instead she teleported away to gather more off world treasures. That's why she was unaware that Magneto's clone had failed in killing the original. The clone caught up with Magneto over central America where a desperate master of magnetism managed to surprise his younger self by knocking him out with a chunk of machinery to the back of his skull. The clone woke up a few days later, suffering from memory loss, eventually making his way towards the X-Men. (Uncanny X-Men I#366) - After searching for her Magneto clone for a long time she found him in an Israeli Mossad compound were the clone, now calling himself Joseph, was being tested by Dr. Hammal. Disguising herself, Astra entered the premises and started questioning her creation. When she realized he was amnesiac, she electrocuted him with her ionic gauntlets and teleported away with him. (X-Men II#86) - Entertaining herself with the captured Joseph, Astra used her technologies to tell her creation about his origins. Astra activated a Kt'knlan recall psitap, that unlocked memories that previously eluded Joseph, making them visible for Astra as well. As she reviewed Joseph's encounters with the X-Men, not to mention his romance with Rogue, an intrigued Astra commented she should get an MRNA Matrix of Rogue, since she could prove useful to her. After she'd learned all she could of Joseph's history after she left him, she decided to reassign him to his original purpose: killing Magneto. A timely move, considering the master of magnetism was threatening to disrupt the Earth's electromagnetic field if his demands of a separate nation for Mutants wasn't met. (X-Men II#90) - Escaping the destruction of the Skrull homeworld at the hands of Galactus, a group of time-travelling X-Men got momentarily stranded in the past. There, they watched Astra and Joseph inside one of her energy bubbles approaching Magneto's base for the final confrontation. Having already seen the consequences of these events the X-Men discussed about intervening. Before a decision was reached, their spaceship was struck by energies from Magneto's tower-base. (Uncanny X-Men I#367) - Astra and Joseph made their way to Magneto's Polar tower courtesy of Astra's energy bubble. All the while, she tortured Joseph for her own pleasure, while announcing she wanted Magneto to die. Managing to gain access to his base, Astra revealed herself to Magneto before blasting the tower's diffusion screens. This forced Magneto to use his body as a lightning rod for all the unchecked atmospheric energies. Hearing her former boss scream in agony pleased Astra greatly. Magneto managed to surprise Astra, however, by destroying her Kree-crafted force field with a magnetic blast. Astra was almost killed, if not for Joseph's timely intervention. (X-Men II#87) - Astra witnessed the fight between Magneto and Joseph, but when their fighting seriously damaged Magneto's Polar tower she teleported to safety. Her presence was detected by Professor Xavier, who, while never having met her, still knew of Astra. Xavier had Nightcrawler teleport Astra away from the tower, which broke her control over Joseph. Annoyed, Astra tried to rattle Nightcrawler by referring to him as Kurt Wagner, a fact she learned while secretly spying on him years ago. She then attempted to knock Kurt out using her ionized gauntlet, but he beat her to the punch. While the X-Men fought Magneto, Joseph attempted to restore the damage caused by Astra. He pushed his powers beyond their absolute limits, causing his body to burn up in the process. Aided by Xavier's telepathy, Joseph was able to hold on long enough to heal the wounds in the Earth's electromagnetic field before he seemingly dissolved into the magnetic spectrum. Not impressed at all that her "son" died a hero, Astra cursed the X-Men for ruining years of work and swore revenge before teleporting away. (Magneto: Not a Hero#4 (fb) - BTS) - Christopher Bach, leader of the anti-mutant group Humans Now, approached Astra with an offer she couldn't refuse. A way to resurrect Joseph and the chance to discredit Magneto since he had gone on to become a hero, one of the X-Men. In return Joseph had to pose as the evil Magneto and kill a small group of Human Now protestors to help gain more attention to the cause. 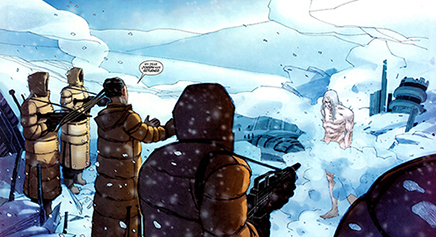 Bach provided Astra with money and manpower to restore Magneto's former arctic base. (Magneto: Not a Hero#2 (fb)) - Astra's men located the Polar tower and started their repair work. When one of the workers dared to complain about her absurd demands, Astra popped in and incinerated the man, claiming he was a negative influence. Astra's display of force motivated the surviving workers to keep quiet. When one of her men informed Astra the so-called "pinch field" was ready to retrieve Joseph from the magnetic field, she hurried outside to see the rebirth of her creation. The minute Joseph returned to life, Astra used her machines to implant him with all of Magneto's old memories, making him see how evil Magneto truly was. (Magneto: Not a Hero#3 (fb) - BTS) - Realizing she couldn't possibly take on the world with Joseph alone, Astra decided to clone the original members of the Brotherhood of Evil Mutants (Blob, Mastermind, Quicksilver, Scarlet Witch and Toad), employing the same alien technologies she had used to create Joseph. However, these clones were abominable looking. (Magneto: Not a Hero#1) - As the deal stood between Astra and Bach, Joseph disguised himself as Magneto and appeared at a Humans Now rally where he killed forty members. When the Avengers, Captain America and Iron Man, wanted to arrest the real Magneto, they were persuaded by the X-Men's leader Cyclops to give Magneto a chance to find the real culprit. 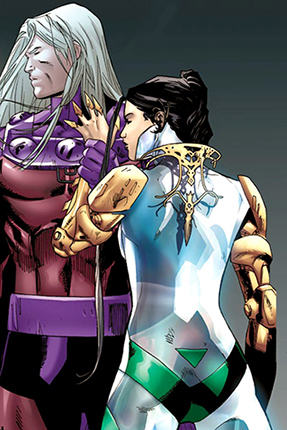 With the help of Emma Frost and a machine similar to Cerebra, Magneto tracked down Astra and Joseph's whereabouts. (Magneto: Not a Hero#2) - When Magneto located Astra and Joseph's secret base in an abandoned factory in the Appalachian Mountains he was escorted by Astra's guards to their lair. In a surprising turn of events, Astra wasn't the one in charge. Instead, she acted completely subservient to Joseph. When offended by Magneto, she slashed at his face. Recalling their checkered past, Joseph decided it was enough, chained her up and walked away with Magneto. Astra was later seen sitting at Joseph's side while the two talked about their tasks to raise mutantkind to the highest mountains. When Magneto angered Joseph by calling him nothing more but a clone, Magneto was struck down and attacked by Astra's clones of the original Brotherhood of Evil Mutants. (Magneto: Not a Hero#3) - Astra and Joseph's Brotherhood of Evil Mutants attacked Magneto, but the master of magnetism effortlessly killed three clones before stabbing Astra through the chest with a metal spear. Joseph was glad to see some of the old Magneto had remained in the original and used his magnetic powers to drop the building on Magneto and Astra. Seemingly unharmed, Magneto returned to Utopia, the X-Men's base where Astra was stabilized and contained in the X-Brig, the X-Men's private prison. Magneto then questioned Astra since he was convinced there was more to her than a mere revenge scheme. Thanks to the psychic Stepford Cuckoos triplets who scanned her mind, Magneto learned Astra's true motives. (Magneto: Not a Hero#4) - As Magneto learned of Christopher Bach's involvement in the resurrection of Joseph he hoped to start a game of chess with Astra. As Astra tried to appeal to Magneto's former evil side, he was telepathically contacted by Emma Frost, who informed him Joseph and his Brotherhood were attacking a huge Humans Now rally in Chicago. Magneto didn't want to involve the X-Men in dealing with his problems and instead freed Astra, asking her to teleport him to Chicago in return. Astra agreed and complied, but didn't stick around to see "her boys" fight. She teleported away before Magneto managed to defeat Joseph, killing Christopher Bach in the process. Astra has been known to use a multitude of alien technology, she revealed to have used some from the following races: Gel'da'nabians, Glyxian, Kree, Krylorian, Kt'knlan, Kymellian and Rigellian. Interestingly enough, she often complains about the repeated failings of the alien equipment. If this is due to poor craftsmanship or caused by her own inexperience in handling advanced technologies is unrevealed. In Uncanny X-Men I#377, Apocalypse notes that he dealt with Astra "quite harshly" for nearly upsetting his plans for Magneto (in the Twelve). What exactly that meant is anyone's guess, though I think we were meant to think at the time that Apocalypse had killed her.